The Smok Vape Pen Plus Starter Kit is a user-friendly all in one pen style vaporizer that makes a great choice for those looking for a lightweight travel vape or beginners just getting into vaping with an easy to operate device. 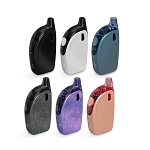 This vaporizer utilizes a direct voltage based output that will automatically adjust the output level to match the remaining battery life, with a massive 3000mAh capacity you will enjoy thick and satisfying clouds all day long. This device is an upgraded version of it's predecessor the Vape Pen 22, it utilizes the same atomizer heads for a wonderful mix balance between flavor and vapor and it also comes equipped with an upgraded 4mL fixed tank atomizer for all day vaping.